The layout of this flat is kinda fun - the bedroom sits on a small platform above the living room, which is accessible by a little staircase and also houses a hidden closet. I'm not totally sure I could live with a black kitchen, but the living room I could quite happily transplant into my flat tomorrow. Sourcebook: the shelves above the sofa are from string and the gold pendant in the dining room is by Atelje Lyktan Bumling. The New York poster is part of a series by David Ehrenstråhle. At present it is discontinued, but rumour has it there's a reprint in the offing before the end of 2015! Similar maps of London, San Fran, Paris and Bombay can be found on his website My Guide To. 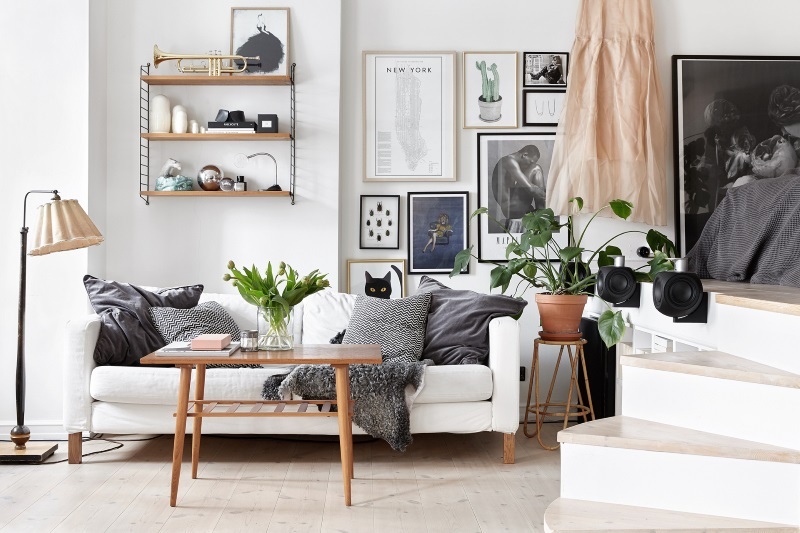 Images courtesy of Fantastic Frank via Coco Lapine Design. Styling by Josefin Haag.